Why Does Pastor Rick Warren Need to be a Member of Council on Foreign Relations? The Council on Foreign Relations (CFR) has been around for a while and it was started by people who belong to the Global Elite. It’s the same Global Elite that has been trying (and succeeding) in bringing their “progressive” agenda to the fore throughout the world. Note the quote below. Too much has been written about CFR and other groups and agencies (like the Trilateral Commission, etc. ), yet interestingly enough, you won’t read about CFR in history books. The Rockefeller name figures predominantly in the creation and maintenance of CFR, Trilateral Commission and other agencies that are connected to the United Nations and that should not surprise anyone. In fact, David Rockefeller’s name is associated with CFR as “honorary chairman.” This is the same David Rockefeller who admitted to being part of a group of elite who have worked to change America and the world to become a global system. This would, of course, ultimately benefit those at the top of the food chain, so to speak. It wasn’t long afterward that Harry Emerson Fosdick produced and delivered a sermon in which he essentially stated that those who adhered to and upheld the fundamentals of the faith – virgin birth, deity of Christ, etc. – were “intolerant.” Though this did not sit well with many people and even forced Fosdick to resign from his current pastorate, “he was immediately hired as pastor of Riverside Church – attended and built by John D. Rockefeller, Jr. for $4 million. Rockefeller paid for 130,000 copies of Fosdick’s sermon to be printed and distributed to ministers. Fosdick’s brother Raymond was president of the Rockefeller Foundation.” Fosdick became part of the “Modernism” movement. This is the type of things that the Rockefellers have done “for” America. They’ve asked religious organizations to downplay the salvation message of the gospel and instead, focus more on the social aspects, by teaching parishioners to do good works. The goal is to topple our government. This is done by changing traditional values throughout society and eliminating or changing the Constitution to allow for things that were never meant to occur. 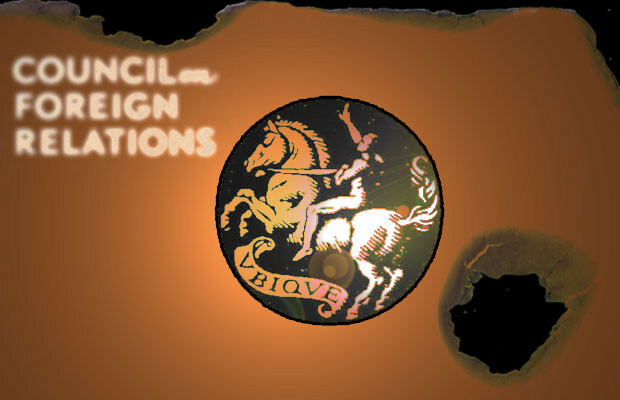 The Council on Foreign Relations grew out of what is known as “The Inquiry” during the presidency of Woodrow Wilson (whose chief advisor, Colonel Edward M. House was a Marxist). In essence, the CFR was then (as now) made up of powerful, wealthy, influential people who were in the position to drive economies, create, end, or postpone war, and in general, direct the affairs of a country because of the hold on that country via the “banksters.” Indebtedness is one of the chief ways that the GE gets things done and the CFR is no exception to that rule, using similar strategies. The CFR has been known to manipulate the office of the presidency in America and it is assumed that the reason the current administration under President Obama works so hard to accomplish things that are completely opposed to the Constitution is due to his full and complicit alignment with the GE. Even Kennedy tried to warn America, which likely resulted in his death. Interesting to note that as soon as LBJ took office, he reversed what Kennedy had done, going back to the Federal Reserve system. Taking just one individual – Zbigniew Brzezinski – we can see connections with him to the presidency back to Jimmy Carter. He is currently one of President Obama’s advisors and has been deeply involved in CFR for decades. Again, why would any pastor feel the need to be part of an organization that at best, appears to have and use subversive tactics to accomplish its deeds? You can view the entire roster of members here. Simply scroll down to the “W’s” to see Rick Warren’s name listed. While I realize that Rick Warren created what is called the PEACE Coalition. His is a socialist-based gospel, where people are taught to do good works and to downplay the presentation of the gospel. Does Warren fit nicely with the goals and aspirations of the CFR? It certainly seems to be the case. “In 2008, backed by a $2 million Rupert Murdoch donation, Warren launched the PEACE Coalition. Time magazine headlined it: ‘RICK WARREN GOES GLOBAL.’ Warren said the coalition’s goal was ‘to mobilize 1 billion Christians worldwide’. Good question. By whom indeed? Entry filed under: Council on Foreign Relations (CFR), David Rockefeller, Political Correctness, Religious - Christian - Theology, Satanism, Shadow Government, Trilateral Commission. Tags: cfr member rick warren, rick warren. Great article! It’s too bad that so many people think Warren is wonderful. Too bad that he will probably hear, ” I never knew you.” In the end .